The following is the New Mexico legislative fiscal impact report for SB-157, a measure introduced by State Sen. Lee Cotter (R-Las Cruces) to restrict use taxes collected in Sierra and Dona Ana counties to paying off Spaceport America bonds. Revenues in excess of what is needed to pay off the bonds are being used to fund spaceport operations. The analysis indicates that excess revenues could be used to pay off the two bonds one year earlier than their 2029 maturation date. However, the restriction would put a gap in the spaceport’s operating budget that would have to be paid by state taxpayers. Spaceport officials are already seeking $2.26 million from the state government for the upcoming 2017 fiscal year to fund operations. The revenue gaps at the $225 million spaceport have been caused by delays by anchor tenant Virgin Galactic, which plans to fly tourists to space from the facility. New Mexico officials are hoping flights begin in Fiscal Year 2018, which will begin on July 1, 2017. Virgin Galactic has not given an estimate for when service will begin. Fiscal impact reports (FIRs) are prepared by the Legislative Finance Committee (LFC) for standing finance committees of the NM Legislature. The LFC does not assume responsibility for the accuracy of these reports if they are used for other purposes. Current FIRs (in HTML & Adobe PDF formats) are available on the NM Legislative Website (www.nmlegis.gov). Adobe PDF versions include all attachments, whereas HTML versions may not. Previously issued FIRs and attachments may be obtained from the LFC in Suite 101 of the State Capitol Building North. bonds approved by voters and issued by NMSA pursuant to statute. The effective date of this bill is July 1, 2016.
to retire the local option GRT sooner than projected, but it would create an operating budget impact on NMSA and likely require general fund revenues to offset this loss. For FY17, NMSA will have exhausted its fund balances and will rely on general fund support and revenues generated through operations. The agency estimates operational revenues will be insufficient to maintain current expense levels for staffing, contracts, and other costs, and requested about six times as much general fund support for FY17 as it received in its FY16 operating budget. The New Mexico Finance Authority provided the following additional analysis. Dona Ana County and Sierra County have both enacted the spaceport GRT. In FY 2015, Dona Ana generated $7,861,911, and Sierra County generated $487,832 in total spaceport GRT. The 75 percent spaceport GRT portion pledged to bond debt service totaled $6,262,307 in FY 2015. Assuming that spaceport GRT revenue generated in Dona Ana and Sierra counties remains level to FY 2015 actual receipts, estimated FY 2016 excess spaceport GRT revenue is approximately $611 thousand. If no other bonds were issued by the spaceport, the accumulation of excess spaceport GRT revenue into a sinking fund would accelerate the retirement of the Series 2009 and 2010 bonds by approximately a year (i.e. bonds would be paid off one year earlier in 2028). Without this revenue or general fund revenue to offset the loss, NMSA would have to substantially curtail operations in FY17. Without certainty regarding the FY17 general fund appropriation for the agency, it is impossible to estimate what personnel, contracts, or programmatic functions would be cut, but NMSA reports it may not be able to operate in FY17 without this funding. The agency states it would be in default of contractual obligations to its tenants and face potential lawsuits for breach of contract. NMSA provides the following additional analysis. The agency has been receiving this revenue since 2011. The average amount varies per year but has historically been about $300 thousand to $630 thousand. Unlike the gross receipts tax bond proceeds that can only be used for construction and pre-operations, the excess pledged GRT revenues can be used for operational purposes per determination of the New Mexico Finance Authority (NMFA). This is extremely important to the spaceport at this point prior to realizing revenues from flights by the spaceport’s anchor tenant Virgin Galactic (VG), and unfortunately, VG had a major setback with the October 2014 spaceship crash. NMSA has other customers and is greatly increasing its business development efforts as well as broadening its business base; however, Virgin Galactic remains the largest revenue source for the agency. Spaceport America is entering a very critical stage in its development. Fiscal years 2016 and 2017 mark years when bond funds are exhausted and maintenance costs are increasing for an aging spaceport. Expenses formerly covered by bonds must now be covered by the operating budget, and new requirements like increased maintenance costs must also be covered by the operating budget. Much is resting on when Virgin Galactic starts flying, which is not expected until FY18. This excess pledged GRT revenue is a lifeline for the spaceport as it can be used for operations, unlike the bond funding, and allows the spaceport to keep its doors open during this critical time. The revenue can either be used 1) by NMSA in its current fashion for any lawful purpose, or 2) to pay off the bonds beginning in 2019 (not permitted until 10 years after the first bond issuance). Without this revenue now, the taxpayers’ more than $200 million investment in the spaceport will be in jeopardy. The bill relates to SB 145, which amends some portions of relevant statutes as part of a larger set of changes to the tax code. 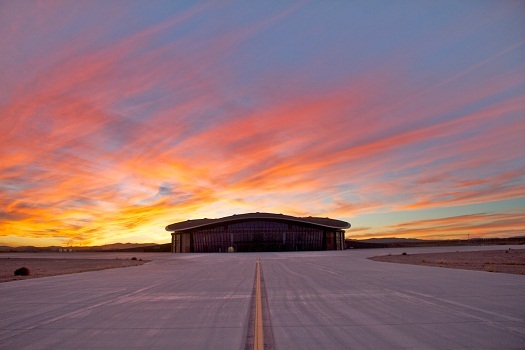 Spaceport America was built with the expectation Virgin Galactic would be the anchor tenant and launch customers into near-space following completion of the necessary infrastructure. The company originally planned for commercial launches to begin as early as 2010, but Virgin Galactic suffered numerous setbacks and delays and has not completed building its replacement spacecraft after a fatal midair accident in October 2014. A potential commercial launch date is likely at least a year away due to the need for additional design and safety testing, leading to continued risk and uncertainty regarding launch revenues for NMSA. An adverse lease provides minimal payments until commercial flights begin, increasing the need for the agency to minimize costs and attract other companies and ancillary businesses to the site. A significant portion of NMSA’s expenses comes from a contract with Fiore Industries to provide emergency and security services. Initially, this contract staffing of security guards and firefighters cost $500 thousand per year, but for FY16, the agency projects it will spend $1.7 million for 12 firefighters, eight security guards, and two administrators, and the agency requested funding to increase the contract to $2.3 million for FY17. This represents one-third of the FY17 budget request despite minimal, infrequent launch activity at the facility. The Legislature appropriated a total of $142.2 million in capital outlay funding to the Spaceport Authority for planning, design, and construction of Spaceport America and related infrastructure. Including the bond proceeds from the incremental gross receipts taxes imposed by Sierra and Doña Ana counties, the total cost rises to $218.5 million. Is this Space Florida’s Mysterious Project Sabel? the personal lawyer for Jay McCleskey, Governor Martinez’s political consultant. He has a lot of influence in the New Mexico legislature. protect Raytheon from encroachment. So much for protection. This sweetheart deal also has Pima County taxpayers forking over money to pay the costs for fixtures, office furniture and other goodies. As if that weren’t enough to insult our intelligence, World View will be allowed to lease the entire facility at a steeply discounted rate over 20 years, and then buy the spaceport for only $10. No, that’s not a misprint — County Administrator Huckleberry confirmed this fact. America. However, he wants to tax food. i won’t say, White Elephant. But…empty buildings in the middle of the desert, costing millions, in need of genuine spaceflight operations. Don’t we as space enthusiasts look like idiots to the general public for not being critical of the mentioned shortcomings? Don’t forget that the road is being built over the Camino Real Trail which is known to be the oldest human trail in North America. Phony studies and corruption so reckless that money is not even the real issue–seems like corruption just for the sake of corruption, pillage and mayhem. Hell, let ’em steal the money–just do not destroy our heritage and make big money while doing it. Parabolic Arc is the only news organization in the world that has honestly reported what is going on with Spaceport America, Virgin Galactic, Abu Dhabi, and the State of New Mexico. No wonder that Doug Messier and the Parabolic Arc were nominated for a Pulitzer Prize for their reporting on this HUGE scam.